Atomic Zoo: Radiation Bred Animals? The Center is continuing its research on mutation breeding that we began back in 2010. In November we will install a triptych installation at the San Jose Museum of Art which will display the past present and future of radiation breeding. Most of our research has centered on the history of radiation breeding in plants. There is an enormous set of records in the IAEA’s Mutation Variety Database. Many of these “useful mutants” are commonplace in human food systems all over the planet. In comparison we have found relatively less information about radiation-bred animals. While we have not completed an exhaustive literature review, we have not run into any documented radiation breeding / animal husbandry programs in the U.S. or elsewhere. One wonders if the AEC scientist were keeping their eyes out for “interesting” phenotypical variation in the lab subjects for the purposes of breeding. Noting and back breeding mutants is what mutation breeding in plants is all about. However, there are ethical and (one would guess) morphological / developmental differences in exposing plants and animals to radiation for the purposes of creating “variation”. Were any of the genetic lines of the later generations of sheep retained? If anyone knows of any historical radiation breeding experiments on animals we would love to be informed. Please email us. 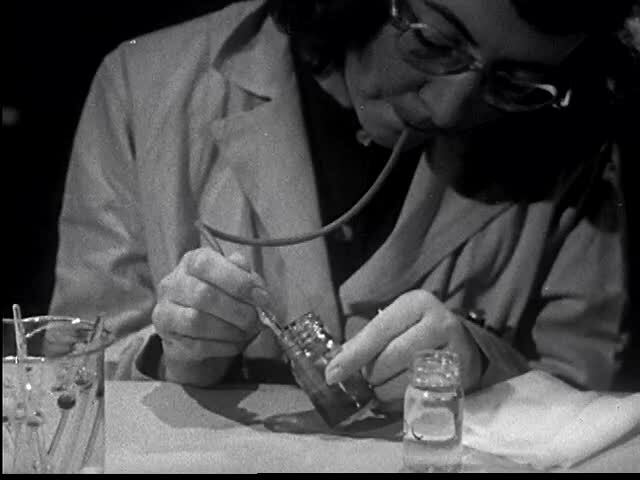 Yum…….radioactive sheep blood being transferred through the use of a MOUTH PIPETTE!